After the sun sets on a summer evening and the sky fades to black, you may be lucky enough to see thin, wavy clouds illuminating the night, such as these seen over Billund, Denmark, on July 15, 2010. Clouds bright enough to see at night are not as hard to find as they once were. These mysterious clouds form between 50 and 53 miles (80 and 85 kilometers) up in the atmosphere, altitudes so high that they reflect light long after the sun has dropped below the horizon. 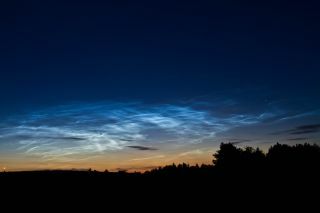 DeLand, an atmospheric scientist with NASA's Goddard Space Flight Center in Greenbelt, Md., has found that night-shining clouds — technically known as polar mesospheric or noctilucent clouds — are forming more frequently and becoming brighter. He has been observing the clouds in data from instruments that have been flown on satellites since 1978. For reasons not fully understood, the clouds' brightness wiggles up and down in step with solar activity, with fewer clouds forming when the sun is most active. The biggest variability is in the far north. Underlying the changes caused by the sun, however, is a trend toward brighter clouds. The upward trend in brightness, DeLand said, reveals subtle changes in the atmosphere that may be linked to greenhouse gases. Night-shining clouds are extremely sensitive to changes in atmospheric water vapor and temperature. The clouds form only when temperatures drop below minus 200 degrees Fahrenheit (minus 130 degrees Celsius), when the scant amount of water high in the atmosphere freezes into ice clouds. This happens most often in far northern and southern latitudes (above 50 degrees) in the summer when, counter-intuitively, the mesosphere is coldest. Changes in temperature or humidity in the mesosphere make the clouds brighter and more frequent. Colder temperatures allow more water to freeze, while an increase in water vapor allows more ice clouds to form. Increased water vapor also leads to the formation of larger ice particles that reflect more light. The fact that night-shining clouds are getting brighter suggests that the mesosphere is getting colder and more humid, DeLand said. Increasing greenhouse gases in the atmosphere could account for both phenomena. In the mesosphere, carbon dioxide radiates heat into space, causing cooling. More methane, on the other hand, puts more water vapor into the atmosphere because sunlight breaks methane into water molecules at high altitudes. So far, it's not clear which factor — water vapor or cooling — is causing polar mesospheric clouds to change. It's likely that both are contributing, DeLand said, but the question is the focus of current research. This story was provided by OurAmazingPlanet, a sister site to SPACE.com.